Beacon Press: What's Wrong With A Free Lunch? 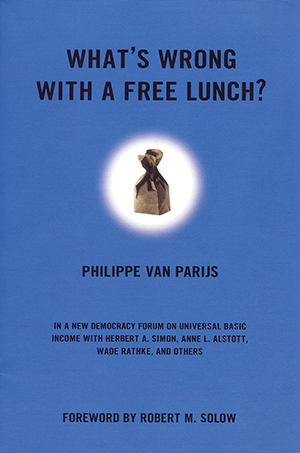 Van Parijs argues that a UBI would reduce unemployment, improve women’s lives, and prevent the environmental damage caused by overproduction and fast growth. At the heart of his proposal is the intention to secure real freedom for all, because it offers the greatest possible opportunity to those with the least opportunities. He acknowledges that an idle surfer might not deserve a UBI, but that the surfer’s good luck would be no different than the good fortune enjoyed by those who benefit from the current distribution of resources. Responses to this controversial proposal vary: Some are in favor of a basic income, but only if it’s tied to work. Others find the entire proposal unrealistic and unaffordable. Almost all agree, however, that it is time for us to talk about this issue.